Cleveland Clinic is striving to be the world’s leader in patient experience, clinical outcomes, research and education. 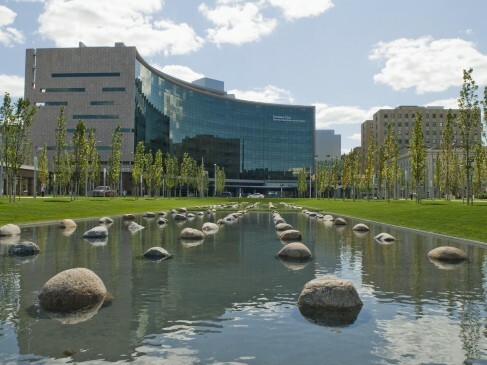 Cleveland Clinic is one of the largest and busiest medical centers in the world with over 6.6 million outpatient visits in 2015 and employing 3,432 physicians and scientists in 120 medical specialties and subspecialties. As a leader in healthcare, Cleveland Clinic is continually looking for ways to improve the health of the communities it serves and reduce its operating costs in order to make care more affordable for its patients. Cleveland Clinic has established a $7.5 million Green Fund— the largest fund of its kind in the healthcare industry and one of the largest in any business sector nationally. Green revolving funds invest in energy efficiency projects to reduce energy consumption while reinvesting the money saved into future projects. As projects pull money from the fund, it is replenished by reinvesting tracked savings from reduced energy consumption, in addition to any rebates received. This dedicated fund will help drive Cleveland Clinic’s continued commitment to energy conservation and overall sustainability, including the goal to reduce energy intensity across its health system by 20 percent by 2020 as part of President Obama’s Better Buildings Challenge. Through the end of 2015, Cleveland Clinic has reduced its energy demand by 12.3 percent as part of this challenge. The savings achieved through these initiatives is value that can be reinvested back into patient care.